The duplicity of hallucination/sight and transcendence/imprisonment is essential to the meaning: flicker cinema breaks the normal illusion of cinema – movement – replacing it with the audience’s self-consciousness of their own immobility. The title of Joshua Gen Solondz’s film Prisoner’s Cinema evokes a simple question: who are the “prisoners” identified in the title? There are no opportunities for narrative projections in this experimental film: the answer to this question is not immediately apparent from the film itself – composed from individual black, white, and graphic frames that create a powerful, rhythmic flicker on screen, the possible answer is almost immediately limited to the people in the audience, but “the audience” is a poor answer in itself. How, or in what way, does “the audience” qualify as “prisoners”? These questions are part of a series of doublings that emerge from a close reading – a difficult mixture of vernacular psychology and classical philosophy where the cinema itself serves as both prison enforcing immobility and the vehicle for the liberation of its audience. These double meanings of cinema and “prisoner’s cinema” illuminate the significance and formal organization of this video. It is in the retreat from the world of everyday vision that this enlightenment arrives – thus the “darkness and solitude is sought out by holy men in caves” as a way of blinding one’s self to the phantasmal illusions of the visible world. Plato’s allegory is encapsulated within the movie theater – the shadows projected on the walls are more vivid than our normal experience; its hyperrealism shows imaginary sights that seem more real and concrete than our own everyday lives. To withhold these images, as flicker films all do, is to turn away from the cinematic world in much the same way that Plato’s allegory turns away from visible reality. The audience is the prisoner in this cinema. 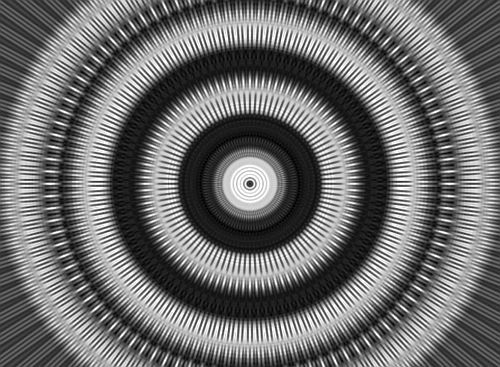 These graphic, repeating patterns can be seen by anyone, and have an extensive relationship to the imagery appearing in abstract films.4 These forms are the vehicle that leads from a vision of the mundane, physical world that is nothing but shadows of reality to an enlightened, interior vision – they visualize the dualities that structure Prisoner’s Cinema. 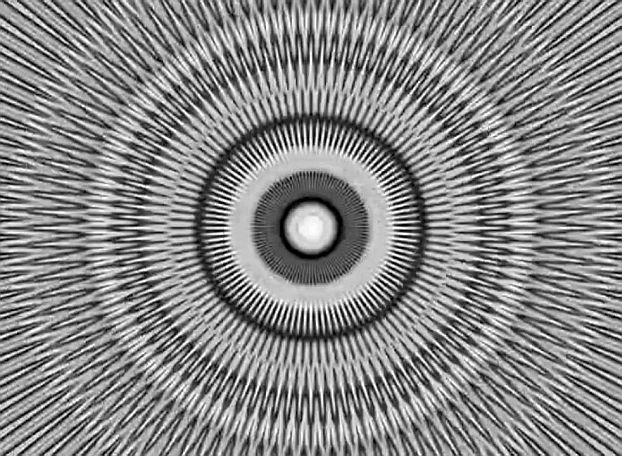 This video is designed to produce hallucinatory images; however, this generation of phosphenes, as well as their re-presentation on screen (see image below), is a secondary effect dependent on the meaning attached to this imagery. The flickering effects are produced by rhythmic alternations of black and white frames, interspersed with grey frames and radial images of increasing complexity. However, these “grey” frames are not precisely grey – they are modulated, their implied imagery suggesting converging rings and rays, differences in density that converge at the center of the frame. 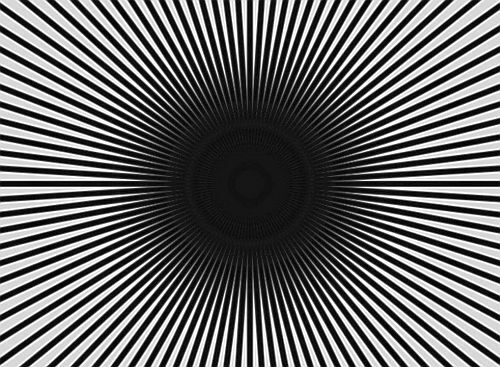 When the radial images first begin appearing, they seem to be emergent from both the white and black frames – a product of their interaction on the retina – as much as a physical presence on screen. It is only later in the movie, as they become more common, that their reality as image becomes certain. This ambiguity that transforms into an awareness of these radiant patterns as image is precisely the point: it is the shift from a hallucinatory perception to a tangible one this transition marks. The duplicity of hallucination/sight and transcendence/imprisonment is essential to the meaning: flicker cinema breaks the normal illusion of cinema – movement – replacing it with the audience’s self-consciousness of their own immobility. (Duration becomes the material “on view.”) The “movement” this cinema presents is a movement inward, the metaphoric movement associated with enlightenment. Carroll’s discussion delineates (and denigrates) two related avenues of development for the flicker film: (1) those works that reified their formal structure around the technical fact of intermittent film projection, in the process linking the “pure” experience of film to the material fact of celluloid and projectors; (2) the deployment of specific formal devices (such as flickering light) as an analogue to psychedelic experience linked to drugs and hallucinations, a variety of “flicker” he discounts as insignificant. When one remembers that “psychedelic” means “revelation of spirit,” this linkage of hallucinatory states and technological apparatus potentially brings these flickering motion pictures into the same lineage as early abstraction in its action as facilitating a primordial, even metaphysical vision. Carroll also noted the linkages between Op Art and the flicker film, a connection that recurs in Solondz’s film as well: what begins as a series of alternating black and white frames (in themselves productive of phosphene imagery) gradually is interspersed with alternating, linear mandala patterns as well. The repeating, radial imagery of these frames resembles paintings by Bridget Riley and Victor Vasarely. This combination of solid and pattern interact in strongly graphic ways on the retina, making the resulting imagery a composite of after-image, hallucinatory phosphene, and actual pattern. It is precisely this optical-perceptual fusion that places this contemporary movie within the tradition of perceptual cinema LeGrice describes. This conjoined pair – hyperaware and comatose – is a paradox, a superposition of two incompatible states that cannot exist simultaneously, thus inducing a struggle for dominance that is dramatized through the experience of watching Prisoner’s Cinema. The integration of phenomenal experience into the formal organization of the work is a reflection of the heritage of earlier perceptual cinema, but at the same time is not a simple evocation and exploitation of perception/experience – the struggle between mental states is at the same time a struggle between being conscious and unconscious. This internal conflict is the metaphoric struggle of the cave allegory: the “ascent into the light” that Plato describes is, in particular, a mental transition. The experience of watching Prisoner’s Cinema forms an essential part of its significance. The struggle between mental states is emblematic of the struggle for “consciousness of reality” associated with metaphysics: motion picture technology brings this conflict into consciousness without necessarily resolving the problem it poses. Instead, it is the awareness of struggle – that there might be a conflict between everyday experience and the metaphysical enlightened consciousness – through the technologically forced collision of incompatible mental states which is the central aspect of the encounter with this movie. The sudden shift to a white screen at the end of his movie (a change where the pronounced flicker caused by alternations of white and black frames stops) can produce very strong phosphene images, but at the same time, it comes as a break in the clinical sense, a collapse of mental focus and the harmonizing of mental states evoked by the movie itself. The persistent phosphenes during this part of the movie are a reminder of the failure to transcend, which the static and pure white screen represent. The motion picture technology employed in Prisoner’s Cinema illustrates and brings the transcendent momentarily into consciousness as the meaning of the spectatorial experience without allowing the metaphysical experience to manifest. In its place is a representation (the movie itself) of what the process of transcendence is, but it is a transcendence that remains unrealized in spite of its elaborate evocation and presentation through the technological apparatus. What transcendence there is in Prisoner’s Cinema is confined to the duration of the cinematic event itself. Prisoner’s Cinema is not commercially available at this writing, but it’s been making the rounds of film festivals as recently as this summer, 2015. For more information on the director, see his Vimeo or Facebook page.